Kailua is a beautiful little town that is located south of Kaneohe, north of Waimanalo, and situated on the windward side of Oahu. It has amazing views, beautiful beaches, and a wonderful little town. Even though Kailua is only 20 minutes (12 miles) from Downtown Honolulu, it may as well be on another island. Kailua is its own city with its own infrastructure, and the town itself has lots of amenities and services such as grocery stores, movie theaters, banks, shopping centers, a bowling alley, and lots of small shops. People who enjoy quaint small towns love Kailua for its layout. A great facelift was done on Kailua Town just a few years ago that has really brought new life to the community. There are many small stores to look around in, and the area's outdoor restaurants are a fun way to spend the afternoon. In Kailua, Christmas and Fourth of July parades are highlights every year. Don't miss the Kailua Thursday Night Farmers' Market in the Kailua parking garage (behind Longs). The market is held every Thursday, from 5:00 to 7:30 p.m. The beautiful Mokulua Islands are just a short kayak ride away from the beach, and is a must-do for all visitors. From just about everywhere in Kailua you can see the Ko'olau Mountain Range, which is a majestic range of jagged green hills that has been featured in many movies and TV shows like "LOST." Read more about Kailua real estate below. In Kailua real estate, single family homes are the dominant property type, though there are a few condos and townhouses as well. Most recently, Schuller Homes has built some low rise condos in the heart of Kailua, called Ka Malanai. These are 2 and 3 bedroom units for between $800k and $1mil. There are also some condos built near the middle of Kailua town on Auloa St. and Auloa Pl, such as Windward Passage, Gardenia Manor, Poinciana Manor, and Hokulani. There are unfortunately no beachfront condos in Kailua, and there are far fewer complexes here than in other areas of Hawaii. There are a few great townhouse complexes like Bluestone in Lanikai, and a couple smaller ones around Enchanted Lake, like Kukilakila, but that's about it. The limited availability of multi-family properties in the vicinity is what keeps the price of Kailua condos and town homes higher than in other areas. 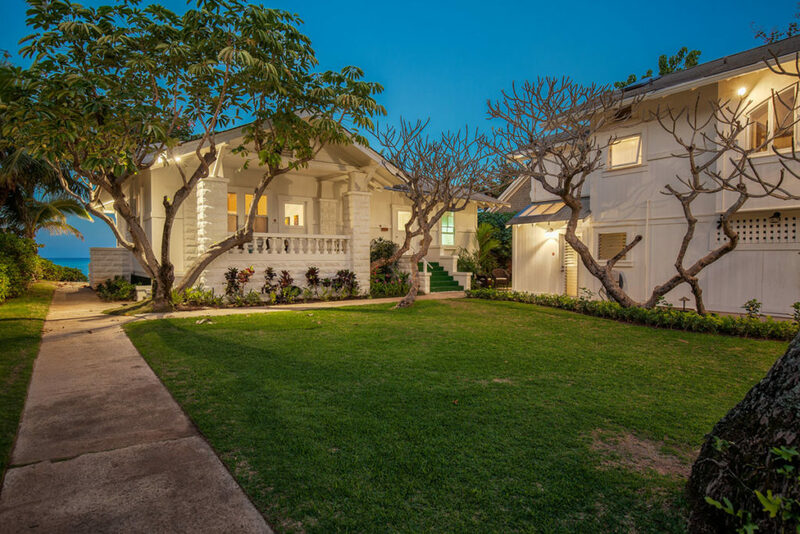 Gorgeous homes can be found throughout Kailua, amidst its many neighborhoods. Each enclave is a little different from the rest, which gives real estate buyers a great selection. The largest residential neighborhood in Kailua is Enchanted Lake. This community was built in the 70's around a man-made lake. This lake is fed by the ocean, but I don't recommend swimming in it. Then there are the neighborhoods of Kailua Bluffs and Keolu Hills, which overlook the lake. While these two neighborhoods are a bit older, many of the homes have been rebuilt or remodeled. Enchanted Lake, Kaopa, and Keolu. These 3 neighborhoods, though distinct in the MLS search, are considered one big neighborhood by most people who live there. In fact, hardly anyone outside this area even knows that there is such a thing as Kaopa or Keolu, since there are no signs or anything else to tell you where they start and end. In my opinion, Keolu and Kaopa are a little bit nicer than Enchanted Lake overall, except for the lake front homes of course. Since the entire area was built around the same time, the 60's and 70's, the houses are pretty similar. One thing about Kaopa and Keolu though, is that a lot of the homes are double wall construction, meaning they have wood studs, drywall inside, and siding or stucco on the outside. Most of Enchanted Lake, on the other hand, was originally single wall redwood - no studs, no drywall. I say originally because over the years, many people have upgraded their single wall construction to double wall. Another thing about Kaopa and Keolu is that the streets seem to be a little wider, and the lots are larger than Enchanted Lake. Some of Enchanted Lake is zoned R7.5, meaning a minimum of 7500 sqft lots, but there are some sections that are R5, meaning 5000 sqft minimum. Compare that to Kaopa and Keolu, which have mostly r7.5, and many of the lots are substantially larger than 7500 ft. This gives these 2 neighborhoods a distinctly nicer feel, together with the wider streets and sidewalks. Oh yeah, some of Enchanted Lake doesn't have sidewalks at all. Just above Enchanted Lake are Keolu Hills, a slight step down in price, and Kailua Bluffs, a big step up. Since Keolu hills has R5 property, meaning a minimum of 5000 sqft, the streets are narrow and the houses are close together. And being built in the 60's, some of the houses have single car carports, and are looking pretty dated. That means there is opportunity for improvement, one of my favorite things about the area. Many people have begun to renovate and even rebuild in Keolu Hills, which means the values are on the rise. 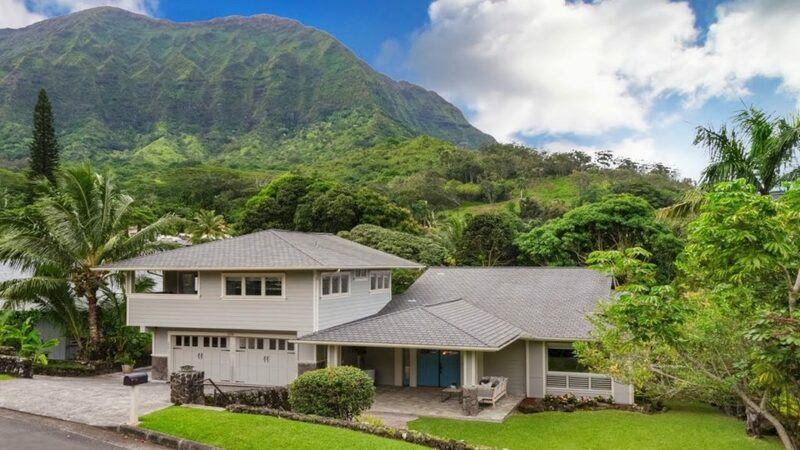 Kailua Bluffs, on the other hand, was built in the 80's, has larger 7500 foot minimum lots, and nicer double wall construction homes with enclosed garages. Prices in the Bluffs are about 20% higher than Keolu Hills, but I group them together because the streets are all connected and they are on the same hill. You will know right away once you have entered the bluffs, since the houses are farther apart and have the enclosed garage. With prices around $1mil - $1.4mil, these are some of the best homes in upper Kailua. The lower part of Kailua near the beach is a large flat neighborhood called Coconut Grove and Kalama Tract, both great for bike rides to the beach. These 2 areas aren't divided by anything geographically, but Kalama Tract has larger lots and more expensive homes in general. Some of Coconut Grove has very small lots, even some under 4000 sqft. This makes Coconut Grove feel a little tighter in some areas, but you're still in a great part of Oahu, so prices can be about $1mil for a decent home. As you get close to the beach in Kalama Tract, the North end of Kailua, the homes can be upwards of $1.4mil if they are large and remodeled, or in a few cases, brand new. Kalama Tract is great because you can ride a bike to a beautiful white sand beach with crystal clear blue water. I've sold many homes in this area, and I can say that everyone I know who has lived in this area has absolutely loved it. There are a lot of older homes in this area, like almost everywhere else on the Windward side, so if you can find an old fixer upper, that can be a great way to make money on your investments. The farthest North you can go in Kailua is Aikahi park. 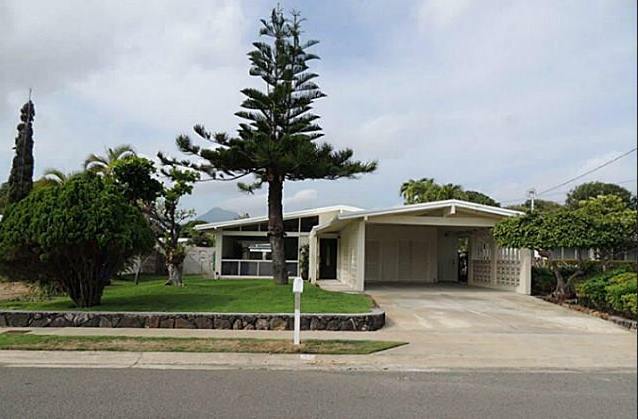 Homes like this mid century ranch home are popular because Aikahi has large lots of at least 10,000 sqft for the most part. People have nicely remodeled a lot of these 1970's homes and made them into modern gems. I actually prefer an old home to a new one sometimes, because of the character of the home, and often the much more mature landscape. Mokapu and Aikahi are basically inseparable, since there is no road between them. Aikahi itself is divided by Kalaheo Ave, but there is no division between it and Mokapu. Homes in this area go for around $1.2mil - $1.5mil. This is a beautiful area, but one caution - there is a water treatment plant that once in a while can cause a terrible odor when the trade winds don't blow the air away toward Kaneohe. Just before you get to Kaneohe Bay marine corps base, at the North East corner of Kailua, is a hidden little gem called Kaimalino. 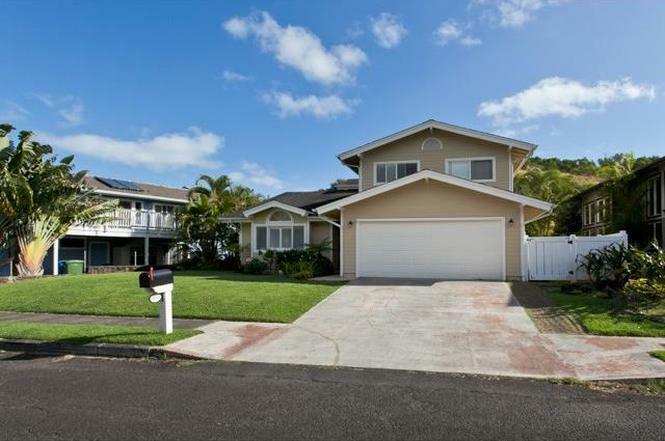 With large lots, large homes, and ocean front property, this neighborhood is definitely one of the best in Kailua. Kaimalino doesn't have any real sand beaches, but it has beautiful ocean frontage with rugged rock terrain, as you can see above. Ocean front with rocks is cheaper than with sand, so you're going to see beautiful ocean views for about $2.5million. 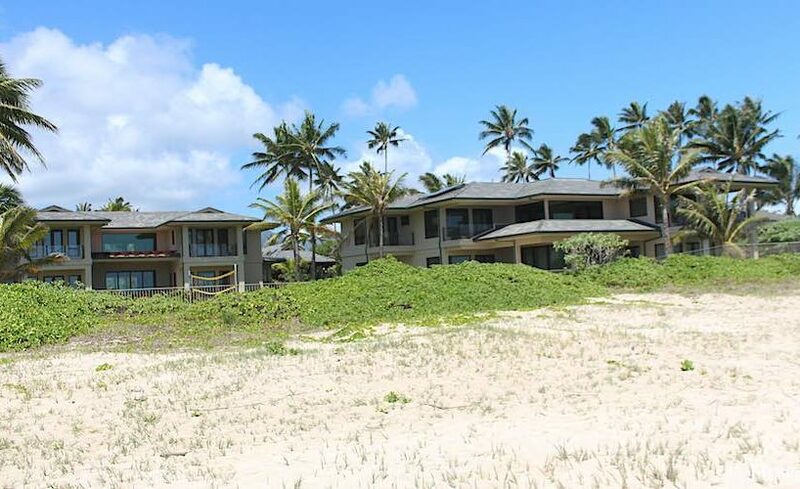 On the sand in Kailua, you're looking at more like $5million to start, up to $15million or more. Kaimalino is one of my wife's favorite neighborhoods, because it has wide streets, grassy yards, big, old ranch style homes, and mid century architecture. If you've ever visited old California beach towns, this one feels a lot like some of the older parts of San Diego. At the top of Kailua, among the lush green hills, are two neighborhoods that you might pass by without noticing on most days. Olomana is the flatter section, with mostly 7500 ft lots and single story homes of around 1800 sqft. It has a nice school that has great reviews, and a solidly middle class feel by Kailua standards. Homes in this area are usually just under $1 million, sometimes a little higher. The advantage of being at the top of Kailua is that you don't have to deal with the traffic getting up to the beginning of the Pali Highway, so you save about 15 minutes or more compared to living down by the beach. It's also much cooler up in Olomana and Maunawili, partially because there is a lot more rain. Rain equals green scenery, and your trade off for being cooler is being wetter, with more mold and mildew year round. Maunawili is even a little higher in elevation, as the hill continues up all the way to the top of the Pali, which means this neighborhood has the most rain of any area in Kailua. More rain means more maintenance for your home with regard to keeping things dry, mold free, and managing your landscape. It's common to see a lot of moss on trees, algae on sidewalks, and a lot of over grown trees. People who love the greenery and lush landscape find that Maunawili is the best place in Kailua, maybe on all of Oahu. It's definitely got a distinctly tropical feel up there. If you're looking for waterfront real estate in Kailua, Beachside and Lanikai are the two main beachfront neighborhoods in the community. Both feature large waterfront estates that are priced from about $4 million, up to $15 million. For around the $2 million mark, Kailua home buyers can find properties that are just a few houses away from the beach. 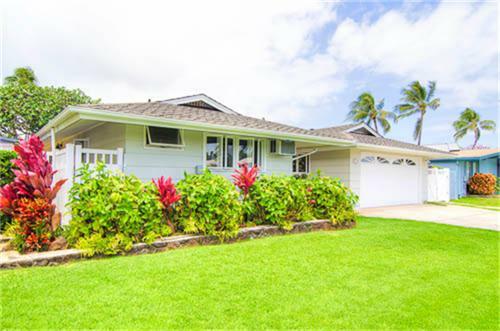 When people hear the words, "Hawaii Real Estate," they typically have an image of beautiful houses set along white sand beaches, with crystal clear waters and gently lapping waves. A nice breeze blows as sunbathers lay on lounge chairs, basking in our tropical paradise. What they're picturing is best exemplified in a neighborhood in Kailua called Beachside. If you can afford to buy real estate in Beachside, then you're going to enjoy the essence of luxury Oahu living. Beachside is one of the best neighborhoods that Oahu has to offer, situated on the widest part of the beach in Kailua. With 2 miles of white sand beach, sky-blue crystal clear water, and the some most beautiful custom homes, Beachside has everything going for it. 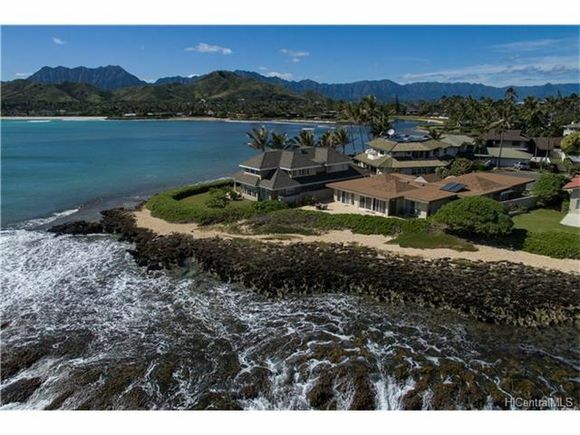 In fact, when President Obama visits Hawaii, he often stays at the end of the beach in a small neighborhood called Kailuana. The average price for Beachside homes is about $1.5 million for a house that's a short distance to the beach, while beachfront homes start around $4 million. What's great about the area is the fact that you can buy a beautiful house just across from the beach, with deeded beach access for about half the price of a home right on the beach. Of course, you don't get a 24-hour view of the ocean, and you can't walk right out your front door and hit sandyou may have to walk nearly 100ft. Yes, life is pretty great if you have $2 million to spend on a home in Beachside. While most homes in this area were built in the 1950's and 60's, there are several newer homes that have been built in the last year or two. These new custom homes will fetch $7-10 million easily. They are gorgeous estates that often sit on an acre with 60-100 linear feet of water frontage. Beachside has the great advantage of being close to the H3 on-ramp. It's also just 5 minutes to Kailua Town, one of the friendliest and nicest little towns in Oahu. It is the best of all worldsa paradise-like retreat with the convenience of Kailua. Selling your Home in Kailua? To get to Kailua, you have to cross the Nu'uanu Palithe tallest peak in the Ko'olau Mountain Range. To drive here, take the H-1 to Pali HWY, then take the Pali north up the mountains into Kailua Town. Be aware that after Kamehameha Hwy, the name of the road changes to Kalanianiole HWY, and then it changes again after Castle Hospital to Kailua Rd., so keep your eyes open. Don't worry too much though; you're mostly going straight anyway. Kailua Beach has been repeatedly ranked among the best beaches in the world, and was named "America's best beach" by Stephen Leatherman in 1998. Kailua Beach has the most amazing white sand, and is home to world-class wind surfing thanks to its great winds and calm waters. In addition to wind surfing, you can also snorkel, scuba dive, kayak, sail, spearfish, and surf. There are also a few golf courses right in Kailua, including Olomana, Luana Hills, and Pali Golf Course. With trade winds blowing for 90 percent of the year, Kailua stays nice and cool with frequent rains. Don't worry if you get rained on in Kailua, it's probably going to let up in a few minutes. Beaches on Oahu are posted with special signs that alert swimmers when there are Portuguese Man-of-War in the surrounding ocean. They look like bright blue floating sea creatures, and are best to avoid. Their sting can be very painful and may lead to serious injury. If you are stung, call the lifeguards for help. If it's a serious case, call 911 for medical evacuation. Kailua is home to a variety of restaurants and eateries, including Japanese, Thai, Mexican, Italian, Pacific Rim, Hawaiian, Chinese, and much more. My favorites are Cinnamon's for breakfast and Maui Tacos for dinner. Also, Mexico Lindo is a great Mexican place right in the middle of Kailua Town. Buzz's Original Steakhouse - located across the street from Kailua Beach Park. Zia's Café - located on Hamakua Dr., next to Boardrider's. This place offers simple Italian fare with average prices. Baci Bistro - on Aulike St. This is a classically romantic Italian restaurant. Times Coffee Shop - situated on Hamakua Dr. Times is a small café that serves the best "fried rice" in the world. Pinky's Pupu Bar & Grill - located on Kalaheo Ave. The Shack - off of Keolu Drive. The place features excellent burgers, and is a little bit loud and rowdy on the weekends. Boot's and Kimo's Homestyle Kitchen - located on Hekili Street. This restaurant has the best pancakes in Kailua, and great macadamia nut syrup. Mexico Lindo - right in the middle of town, with excellent Mexican food. Thinking of selling your home in Kailua? My comprehensive marketing program will take your property listing and reach million of buyers from around the world! Since there are literally hundreds of REALTORS ® working in Kailua, it's important that you choose the right one to market your property. I'll put my money where my mouth is, and offer you a cash guarantee that tells you I'm serious about selling your home! I'll be glad to send you a free information kit to show you what I can do to market your home. Simply contact me for a free home valuation kit. As your REALTOR ®, I'll help you sell your Kailua home for the highest price possible, and in the shortest time possible! Check out my client testimonials to see how past clients feel about my services, and if you want to speak with any of them personally, please email me for their contact info. Contact AlohaTony to learn more about buying or selling Kailua homes & properties.